Following the huge success of Miss World Canada 2012, renowned Canadian producer Andy Chu is set to return to produce the Miss World Canada 2013 crowning gala on May 8th and 9th, 2013 at River Rock Casino & Resort in Richmond, B.C. VANCOUVER, BRITISH COLUMBIA (February 28th, 2013) – Miss World 2013 the 63rd edition will be held on September 2013 in Jakarta, Indonesia. The Canadian crowning gala is happening on May 9, 2013 at the River Rock Casino & Resort in Richmond, British Columbia. Andy Chu has been chosen to produce and direct this prestigious gala event and would like your support by being a part of this special event. The Miss World competition, dating back to 1951, with over 120 countries and territories participating, is one of the oldest major intentional beauty pageants. Under the slogan Beauty with a Purpose, this prestigious event has set out to find young women with the intelligence, empathy, humility, and personality to match their stunning beauty to promote international humanitarianism and philanthropy. The Miss World Canada 2013 crowning gala will select our Canadian Ambassador to represent Canada and promote these values internationally. 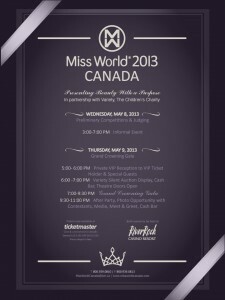 Please visit http://www.missworldcanada.com for more information. Andy Chu is the creative and visionary force behind Arc 2 Intertainment, his advanced production company develops and produces television, films, and promotional events. Andy’s dynamic personality and energetic spirit has made him an innovator in the field of entertainment. Along with his extensive resume of film and television credits, Andy is the creator and producer of the Stripped Concert Series, FMA Fashion Week and Fashion Rocks as well as FMA Awards Gala annual event, a large-scale fashion, music and art concert. His current projects include television series “My Pet Diaries” and “The Big Show”. Andy received three Leo Awards Nominations on his hit television series “FMA Entertainment Weekly” and “Real Estate 101”. He is also the board of director of Vancouver Asian Film Festivals.